admin : November 10, 2012 4:27 pm : 2012. RRWPC’s work is more critical than ever…..
admin : November 8, 2012 2:05 pm : 2012. Well finally, the day has come when we can talk about the Estuary Management Project and the settlement of our lawsuit. It’s been almost a year since we filed our challenge of the plan to raise fresh water levels in the estuary lagoon in order to assist the growth of juvenile steelhead preparing for their ocean sojourn. The dams are in, the temperature is heating up, river flows are very low, beaches are crowded, the algae is starting to bloom, and summer on the lower Russian River has truly begun. And, according to test samples, the river has been mostly free of bacteria. State water shortages motivate promotion of “toilet to tap”….. In their concern about future water shortages expected from global warming and rapidly diminishing water resources, especially in Southern California, California officials are fast tracking legislation that will reuse vast amounts of treated wastewater. As the drought continues, there is more and more concern about this summer’s river flows. Already the Sonoma County Water Agency has declared the month of March to be critically dry, based on low runoff into Lake Pillsbury. 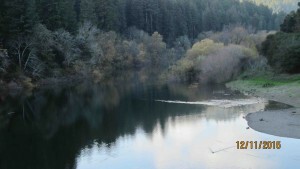 This designation in turn triggers greatly decreased releases from Lake Mendocino all month. It’s not a huge cause for concern just yet, since releases are recalculated monthly until June, but if we don’t get significant rainfall soon, it can be a harbinger of things to come. It’s been a strange, almost waterless winter so far. As I write this in mid-January, we’ve gone over six weeks with no rain. When spring comes, we may be biting our tongues, wondering why we didn’t appreciate the cold, sunny days? In recent years, February and March brought big storms and brimming reservoirs. Let’s hope we see that again this year, especially since late rains assure decent river flows most of the summer. RRWPC will be tracking numerous issues in the coming year. Here’s a summary.